This delightful cotton and wool seasonal wallhanging is from Buttermilk Basin. Each month for 12 months you'll receive the center block that represents each month. In the first month you'll also receive the pattern and fabric to create the background mat. 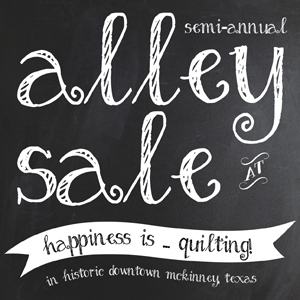 The Alley Sale is busting at the seams with more than 20 vendors selling their quilt related items and projects. This is a great way to find a deal on fabric, notions, and completed projects. Shopping is from 10 a.m. - 3 p.m. this Saturday, Oct. 12. Don't miss out on these deals! Interested In Learning Wool Applique? Jill is teaching her Intro to Wool Applique class this Friday, Oct. 11, from 2 p.m. - 5 p.m. This is a wonderful basic, get-your-feet-wet class that will most definintely get you hooked. You'll learn about various wool textures and blends, threads, needles and much more while making an adorable pincushion. Sign up now! Want To Make Your Wool Projects Shine? Are you ready to add depth to your wool applique projects as well as make them pop? Join Jill for her 2-part class on Wool Embellishment on Saturday, Oct. 12, from 10 a.m. - 1 p.m. and Saturday, Oct. 19, from 1 p.m. - 4 p.m. You'll learn how to use a variety of stitches, beading and couching techniques to take your projects to the next level. Enroll now. Join Janet for this fun project class. In this class you will make a kaleidoscope quilt from a fabric with symmetrical design elements. This concept was developed by Paula Nadelstern. You'll absolutely receive "oohs" and "ahhs" with with quilt. Register here. Have you always wanted to make a feathered star quilt but was daunted by the points? Le M.J. take the fear away with her Bucket Buddies Feathered Star Quilt 2-part class on Thursday, Oct. 17, and Thursday, Oct. 24, from 10 a.m. - 1 p.m. You'll come out of this class with the sharpest points around. Sign up now.